"Menacingly delicious, with the powerful, aromatic punch of whole flower American hops backed up by rich, German malts. HopDevil Ale® offers a roller coaster ride of flavor, coasting to a smooth finish that satisfies fully." This IPA from Victory Brewing Co., pours a dark amber in colour. Very rich copper. One finger of off white head builds on the top with tiny bubbles. Gentle carbonation streams from the glass. Earthy hop notes and caramel biscuitiness dominate the nose. Mild hints of citrus are present, but not abundant. Overall pleasant. A lot more malty that I was expecting. You definitely get those caramel malty flavours right away. Subtle citrus and floral notes balance out the taste profile. A very malt forward IPA. The mouthfeel is quite silky from the super fine bubbles. I have heard so many great things about this brewery. I was expecting a little more hop flavour to come through, but under florecent lighting and sitting on a shelf could have diminished this. Very pleasant beer with a nice maltiness. Sweet and sessionable. Decent beer. I would give it a B+. I would like to compare with a known fresh bottle in the future. 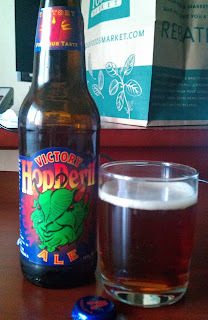 Posted in: Cory,IPA,Victory Brewing Co.